InfiniteBody: The Bessies at BAM: Yes, we've got winners! The NY Dance and Performance Awards, The Bessies, New York City’s premier dance awards honoring outstanding creative work in the field, announced the complete list of the 2015–16 season award recipients tonight at the 32nd Annual Bessie Awards ceremony at the BAM Howard Gilman Opera House, hosted by acclaimed choreographer, writer, and comedian Adrienne Truscott. Awards were presented in the categories of Outstanding Production, Outstanding Performer, Outstanding Music Composition/Sound Design, and Outstanding Visual Design, with additional awards presented for Lifetime Achievement and Outstanding Service to the Field of Dance. The evening included performances by Joya Powell, recipient of the 2016 Outstanding Emerging Choreographer Award, an excerpt from Donald McKayle’s Rainbow ’Round My Shoulder (2016 Bessie for Outstanding Revival), performed by Dayton Contemporary Dance Company and produced by Paul Taylor American Modern Dance, and a tap tribute to 2016 Lifetime Achievement in Dance recipient Brenda Bufalino. Composer and director Meredith Monk presented Eiko Otake with a Special Citation for her A Body in Places platform, presented and produced by Danspace Project. Dancer Ayodele Casel presented Brenda Bufalino with the 2016 Bessie for Lifetime Achievement in Dance. 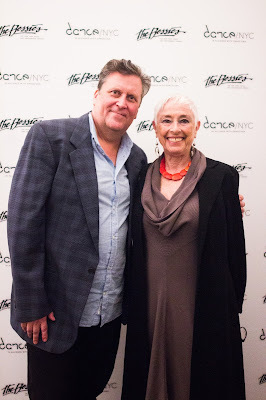 Judy Hussie-Taylor, Executive Director & Chief Curator of Danspace Project, and Alastair Macaulay, chief dance critic of The New York Times, presented an award for Outstanding Service to the Field of Dance to The Jerome Robbins Dance Division of The New York Public Library for the Performing Arts. Alex Smith, Executive Chairman of the Thelma Hill Performing Arts Center also received an award for Outstanding Service to the Field of Dance, presented by Philadanco founder Joan Myers Brown. Other presenters included Tei Blow, Ishmael Houston-Jones, Judith Jamison, Amar Ramasar, Regg Roc, Carlota Santana and Alice Sheppard. The 2016 Bessie Awards are produced in partnership with Dance/NYC and presented in partnership with the Brooklyn Academy of Music. For making herself “radically available” in public and private spaces over several weeks, actively engaging with pressing political and environmental issues of our time. For collaborating with a wide range of artists through performances, readings, films, discussions, and rituals to evoke the power and meaning of the human body inhabiting a planet in crisis. For her visionary work ensuring the future of the American art form of tap dance with the formation of the American Tap Dance Orchestra and Foundation. For introducing innovative concepts to tap choreography and for inspiring a new generation of tap artists to expand the art form. For giving the ephemeral art of dance a rich afterlife through its unrivaled collection of video, writing, photos, choreographers’ notes, and more. Thanks to decades of work by dedicated staff and leadership, dance’s past is there to be remembered, recovered, discovered, and imagined. For investigating the artist’s experience of home and not home, of African and American identity, of ancient rhythms and modern jazz in a work that gloriously communicated the clash and reconciliation of the different traditions held within one’s life, one’s body. For a visually stark and surreal depiction of the emotions, strength, and rage of generations of women and girls struggling under the constraints of society’s image of what it is to be female. For masterfully transforming the museum environment into an inclusive performance space in which the viewer’s gaze was directed from performer to spectator, putting all bodies on display. For a complex meditation on the black female experience in our culture, exploring its expression, projection, and manipulation. For mining Southern family stories and pop culture icons to create a work that troubled, entertained, and challenged its audience. For a presence and a skill that is immediate and unmistakable, explosive and captivating. For her vibrant contributions to the works of Michelle Dorrance, Doug Elkins, Rennie Harris, Bill Irwin, Cori Olinghouse, Gus Solomons jr, and others. For his powerful athletic technique combined with a riveting clarity. For extending the improvisational tradition of tap with a show danced in dialogue with musicians Alex Blake, Bill Ware, and Samuel Torres at the Blue Note. For her introspective and tenacious performances, demonstrating her clear intention and visceral choices, and embodying the choreographic intention of a wide range of artistic processes in the work of luciana achugar, Maria Hassabi and Donna Uchizono. For impeccably representing the traditional values of classic modern dance while forging new paths with his sublime artistry, technical precision, and passionate presence with Alvin Ailey American Dance Theater. For building a sound system which enabled an infinitely varied aural world, using drums, percussion instruments, pieces of paper, mobile phones, wine bottles, and more. The percussionists and dancers equally inhabited an everchanging composition in Rebecca Lazier’s There Might Be Others. For creating an immersive and interactive environment of boxes that metamorphosed in tone and purpose, from towering backdrop to dresser drawers to ritual containers for Pat Graney’s Girl Gods. For giving a classic modern dance powerful new life, transforming the midcentury portrayal of an African-American prison chain gang into a searingly resonant cry for our current times, performed with humanity, craft, and beauty. for her passionate choreographic engagement with issues of justice and race in our communities and our country, for connecting with the audience in ways that make it clear that these concerns belong to all of us—and action is required. for using form and structure as a vehicle for challenging audiences to think, to feel, to experience movement; for pursuing her uniquely poetic and theatrical vision with astounding rigor and focus. The 2016 Bessie Jury was comprised of Yoshiko Chuma, Liz Gerring and Bill T. Jones.